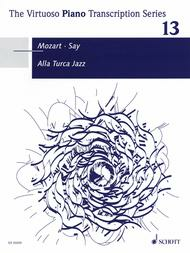 Alla Turca Jazz (Fantasia on the Rondo from the Piano Sonata in A Major, K. 331 arranged by Fazil Say). 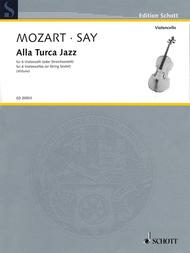 Composed by Fazil Say and Wolfgang Amadeus Mozart (1756-1791). Arranged by Werner Thomas-Mifune and Fazil Say. For String Sextet, Cello Ensemble. String. Score and parts. 32 pages. Schott Music #ED20503. Published by Schott Music (HL.49017640).Turkish pianist and composer Fazil Say (b. 1970) arranged this piece as an effective encore for piano. In this edition, it is arranged for six cellos (or string sextet). Alla Turca Jazz (for Piano). Composed by Wolfgang Amadeus Mozart (1756-1791). Arranged by Fazil Say. For Piano. Piano. 8 pages. Schott Music #ED20209. Published by Schott Music (HL.49016752).ISBN 1476814821. 9x12 inches.Based on the final movement of Mozart's Rondo Alla Turca, this arrangement by Turkish composer Say (b. 1970) incorporates typical jazz elements into this classical masterwork, creating a challenging, encore-ready showpiece.